The battle continues to rage outside. Luke and his friends continue to perform aerial gymnastics while avoiding laser fire and sending in some of their own. The Republic management continues to monitor things back at the base. Suddenly, something new appears on the display. The control officer contacts the ships. Squad leaders, we’ve picked up a new group of signals. Enemy fighters coming your way. Luke looks around to see if he can spot them. My radar’s negative. I don’t see anything. Keep up your visual scanning. With all this hoopla around them, they’ll be on top of you before you can pick them up. Silhouetted against the Series Winner, four Imperial fighters head into the fray, splitting into two groups to try to take down the Republic forces. One immediately attaches itself to Tuivailala. Tui! You’ve picked one up….watch it! I can’t see it! Where is it? Tuivailala, finally picking up the threat, continues to perform wild maneuvers to try to rid himself of the Imperial player. He’s on my stuff tight. I can’t fool him….I can’t fool him! Hang on, Tui, I’m coming. Tuivailala dives for the Series Winner’s surface, followed by the Imperial. Luke quickly makes up the distance and dispatches the fighter. Inside the station, Rizzo strides down a hallway and finds two other pilots (Jon Lester and Kyle Hendricks). Several fighters have broken off from the main group. Come with me! The Republic brain trust continues to listen in on the communications of their pilots, continuing to worry about them as they do. (over speaker) Pull in! Luke, pull in! (over speaker) Watch your back, Luke! Out in space, we see Luke’s ship being stalked by an Imperial fighter as he swoops around the Series Winner. The Imperial gets off a shot that clips Luke’s vehicle. I’m hit, but not bad. Oh-two, see what you can do with it. As smoke billows around the droid, Oh impassively gets to work trying to limit the damage. Luke continues to move up and in and down and away, but with little success. Luke tries to skim the surface of the station with the Imperial right behind. Rosenthal comes from the opposite direction at a slightly higher angle and takes care of the chasing Imperial with a blazing bolt. We see the three offensive ships of Holliday and his crew starting to change position. This is Gold Leader. We are starting our attack run. I copy, Gold Leader. Move into position. As Gold Squadron starts to navigate the trench, Darth Rizzo and his wingmates appear above the trench and dive for it. As Holliday and his flankers run down the trench, they begin to relay information to their compatriots and the Republic management. How many guns do you think, Gold Five? 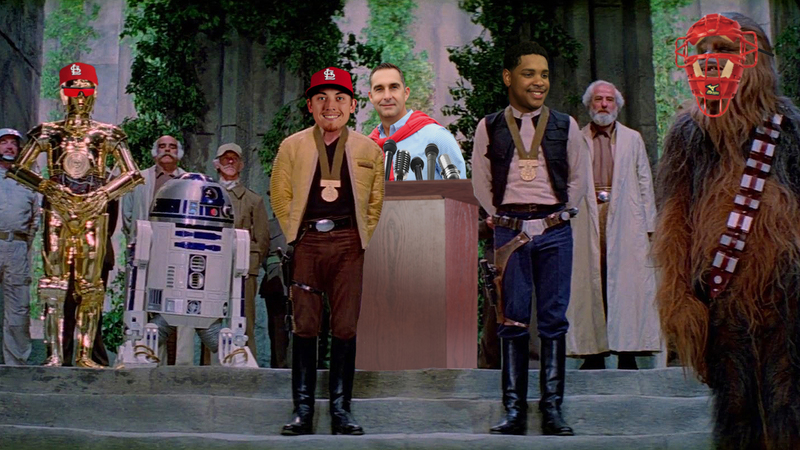 Back in the Republic, Mozeliak and Oquendo have been joined by General Yadier Molina. They hear Gold Five’s response. I’d say about twenty guns, some on the surface, some on the tower. We’ve got a ball game now, folks. The Series Winner will be in range in five minutes. Hang on to your seats. Back in the Series Winner trench, the offensive ships race for the target. Holliday pulls down the targeting computer and places it to his dominant eye. Gold Two, flying slightly behind Holliday, also gets his targeting computer lined up. Computer’s locked. Getting a signal. Suddenly, there’s peace around the ships. Stabilize your rear deflectors. Watch for enemy fighters. They’re coming in! Three marks at two eleven. The Imperial ships, in smooth formation without hesitation. Rizzo adjusts his piloting gloves and gets set. I’ll take them myself! Cover me! Rizzo and company swing in behind the Republic fighters. He quickly blasts Grichuk into smithereens. Holliday looks back and sees the Imperial fighters chasing him down. Rizzo calmly adjusts his gloves, sets the target, and fires. Holliday goes up in a ball of flame. Piscotty, staying focused, continues to the target zone while reporting in. Gold Five to Red Leader. Lost Randal, lost Matty. They came from behind, like they were used to the cellar and just rose up. Rizzo blasts one of Piscotty’s engines, spiraling him into the walls and creating a huge fireball. Inside the Series Winner, Manager Maddon is monitoring the battle. He is approached by a chief officer. We’ve analyzed their attack, Skip, and there is a danger. Should I have your ship standing by? Evacuate? In our moment of triumph? I think you overestimate the curse! Maddon turns his attention to the computer readouts. The progress of the Series Winner is noted in reds and greens. Republic base, three minutes and closing. Just enough time for a frosty Budweiser. Out at the battle, Wainwright looks over the situation and his men. Back at the base, Molina begins to sketch out something while the rest listen in. Rendezvous at mark three point four. This is Red Two. Flying towards you. Red Leader, this is Home Base. Keep half your group out of range for the next run. Copy, Home Base. Luke, take Red Two and Three. Hold up here and wait for my signal to start your run. Luke, Rosenthal, and Tuivailala cruise above the Series Winner while Red Leader and two other ships head for the trench. Wainwright and company start down the trench, avoiding the laser blasts from the big guns. Wacha, who is one of Wainwright’s wingmen, looks around for the enemy fighters. We should be able to find the zone by now. Keep your eyes open for those fighters! There’s too much interference! And I can’t turn around because of the stress reaction in my shoulder! Luke, can you see them from where you are? Luke, flying above the fray, does a visual scan. No sign of any…wait! Coming in point four two. Wacha looks up through the clear ceiling of his cockpit. Rizzo, Lester, and Hendricks again come racing down the trench in perfect formation. As they close, Wainwright activates his targeting computer. I’m in range. Target’s coming up! (to his wingmates) Close up formation. While Wainwright continues to aim at the zone, Rizzo closes the distance between Wacha and Red Twelve (Miguel Socolovich). Rizzo fires and Socolovich goes up in smoke. Wacha urges Wainwright to hurry. Rizzo’s laser fire lances out and smashes Wacha’s fighter, again putting him out of the action. Meanwhile, Wainwright continues to focus on the quickly onrushing port. The targeting computer beeps and he lets go of his torpedo. Inside the Series Winner, soldiers and officers are fiercely jostled as their station and hopes take a huge hit. However, when the smoke clears, the station is still standing. Negative. It was a sharp curve that just nicked the bottom of the zone. Didn’t get a clean strike. Unsurprisingly, Wainwright now has Rizzo’s attention. He doubles back to take care of Red Leader. Red Leader, we’re right above you. Turn to point oh-four; we’ll cover for you. Stay there. I just lost my starboard engine and no surgery is going to fix this one. Get set to make your attack run. As Wainwright tries to get some semblance of control of the ship, Rizzo swings around and takes care of that plan, razing him with laser fire until he crashed on the surface of the station. Luke, looking out of his cockpit, sees the fireball and realizes how difficult this really is going to be. Meanwhile, back in the station, victory seems almost assured. Republic base, one minute and closing. Holy cow! Inside the Republic base, Mozeliak and company have terribly worried expressions. There seems little that can be done. They hear Luke come over the speaker, taking command even though he’s one of the least experienced guys out there. Tui, Rosie, let’s close it up. We’re going in full throttle, top of the radar gun speed. Luke, at that speed will you be able to pull out in time? We’re used to that, but you typically aren’t hitting those levels. It’ll be just like Kissell Canyon back home. The three fighters dive toward the station and get into the long trench, making their attack run. We’ll stay back far enough to cover you. My scope shows the tower but I can’t see the exhaust port! Are you sure the computer can hit it? The ships start taking fire from the Series Winner’s guns. The pilots continue to look around for the enemy fighters. Watch yourself! Increase speed full throttle! You worry about those fighters! I’ll worry about the tower. The guns shoot a laser blast that nicks Luke’s ride. Oh-two, the stabilizer has gotten loose again. See if you can’t lock it down. Without emotion, Oh extends a mechanical arm and starts working on the wiring. The trench walls rushing by, the laser bolts flying around, nothing distracts him from the task at hand. As the target gets closer, Luke switches on his targeting computer. Along with the visuals, he also starts getting directions from General Molina about the best way to go about things. Suddenly, Rizzo and his men show up behind the three fighters. He targets Rosenthal, but isn’t able to get a clean hit on him. He did enough damage, though, to cripple Rosie’s effectiveness. I’m hit! I can’t stay with you! Get clear, Rosie! You can’t do any more good back there! Rosenthal pulls up and gets himself out of the fray, leaving Tuivailala and Luke alone with the three ships bearing down. Rizzo doesn’t care about the escaping ship. Let him go. Stay on the leader. All the ships–the three Imperials, the two Republic–continue their break-neck race down the trench. Hurry, Luke! They’re coming in much faster this time. I’m not sure my heat can hold them off! As the ships get closer, Luke looks for more speed. Oh-two, see if you can’t increase the power! As impassive as a stone statue, Oh diligently begins tinkering on the ship, trying to improve the velocity. The Imperial ships, though, creep ever closer. 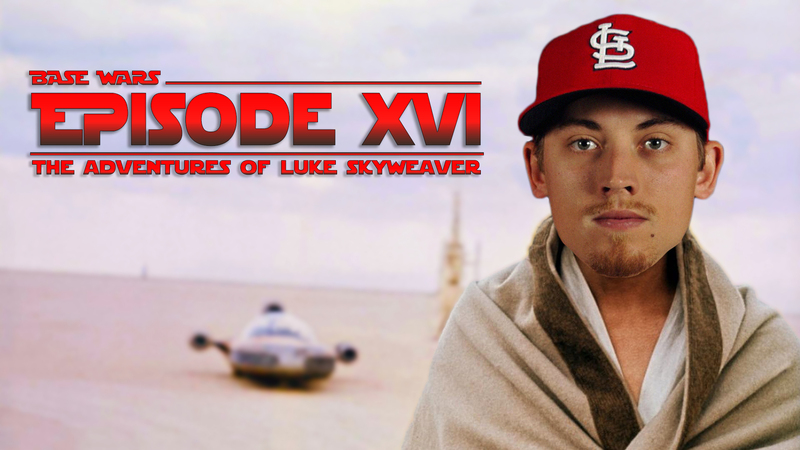 As Rizzo and his wingmen get Luke in their sights, Rosenthal looks to cover Luke. That only puts him in Rizzo’s sights. Rizzo obliterates Rosenthal’s offering of defense, leaving just one Republic ship in the trench. All hope seems lost as the Series Winner is just 30 seconds away from the Republic base. As Luke continues to race for the exhaust port, there are grim faces throughout the Republic leadership at the base. Eugene, for one, is concerned about his friend’s fate. Luke continues to check his targeting computer and internalize the commands from Molina while the other ships continue to get closer. Rizzo tries to get Luke in his targets, but Luke continues to move back and forth. Suddenly, Luke hears a familiar voice. Luke, thinking he’s hearing things, shakes his head and again looks to Molina for guidance. Rizzo seems to have picked up on something as well. Trying to get a fix on Luke has become tougher. Command is strong in this one. In his cockpit, Luke continues to debate what he should do. Luke finally makes up his mind. He switches off the targeting computer and with it the live feed from General Molina. Back at the Republic base, this unsurprisingly causes some serious alarm. Luke, you are shaking off Molina. What’s wrong? As Luke continues to navigate, the Republic base gets chilling news. The Series Winner has cleared the planet. It’s here, folks, and it’s going to be hard to get that big red W.
On the Series Winner, Manager Maddon looks up from planning his next fashion theme day as he receives the same news. He relays an order to the nearest officer. Commence primary ignition. I’m already well ahead of you in being lit. Buttons are pushed. Levers are pulled. Meanwhile, outside Luke gets with shooting distance of his goal, but Rizzo has him locked in. As Rizzo unleashes a volley toward Luke, suddenly one of his wingmen goes up in a ball of flame. Distracted, Rizzo misses Luke and looks for the cause. Coming from out of nowhere is the Reyes Arsenal. The second of Rizzo’s wingmen tries to avoid the Arsenal’s attack, but spins into Rizzo’s ship. Rizzo is sent spiraling away from the Series Winner while the wingman meets the same fate as his friend. You’re all clear kid. That’s what some high heat can do for you. Now let’s blow this thing and go home. Relaxed and fully within the grasp of Command, Luke unleashes his torpedoes. They start outside then dart right down the middle of the port. The Republic ships race for safety while the Imperials, unaware their fate is sealed continue to go about their business. Suddenly, the Series Winner goes up in a huge fireball, with parts scattering in every which direction. Great shot, kid, that was one in a million. The GOAT. Greatest of all time, I mean. Luke, still processing what has happened, hears the voice one more time. Remember, Command will be with you always. Inside the Republic base is a special auditorium. The doors are embossed with golden bats and the walls are red while the carpet is a dark green. An arch stands at the back of a raised area where Mozeliak, Oquendo, and Molina stand with Eugene and Oh off toward the wings. The entire Republic staff, from all levels, stands in the room on either side of a long aisle. Everyone faces that aisle as Luke and Reyes walk in, followed closely by Kelly. Once the three reach the stage, Kelly flashes a signal and all Republic personnel smartly turn and face the stage. Beaming, Mozeliak awards both Luke and Reyes with a valuable long-term contract, thanking them for their service. They accept and turn to face the cheering crowd as the credits roll. As always, thanks to Daniel Winnett for his great work throughout the whole series. Hope you’ve enjoyed it and I thank you for humoring me!